Docker and containerization are all the rage nowadays, but what are they, and what makes them so technologically appealing? We should first consider the problems that they are trying to solve. Let’s say that you have an application you want to deploy: some code that will have to run on another machine, either your own server or in the mystical cloud. How can you be sure that your app will work after you deploy it? Of course, you have tests, and of course, they are passing before you even consider releasing, so you know that it runs fine on your computer, but that’s not where we’re deploying. On a different computer or in a different environment, there’s no real way for us to ensure that something won’t break somewhere because the configurations don’t perfectly match up. Now let’s consider a slightly different problem. Perhaps your application has become incredibly popular. Congratulations. But the immense attention its now receiving is causing a serious degredation in the performance. How can you scale to meet your users needs? You could buy a nicer server or upgrade your cloud instance, but that’s pricey and can only get us so far. What we need is an effective way to scale outward, or horizontally. Virtual machines can be a viable solution to these problems. They serve as full-fledged computers implemented solely in software. Its like having a computer inside your computer. They’re entirely self-contained, which solves the consistency issue: instead of shipping code, you can ship a VM that has your code on it. So long as you deploy with the same machine you test with, you can rest assured that the two environments will remain consistent. Virtual machines can also aid in terms of scalability, though in a limited fashion. If you design your application appropriately, you can scale by adding new instances of your VM to a pool in production. When a user hits your service, they will utilize only part of your total deployment, leading to a distributed workload. Of course, developing an application for this kind of architecture is no small feat, since distribution introduces problems of consistency and fault-tolerance, to name a few. So why even bother with containization when we already have virtual machines. A large drawback to VMs is that they are bulky. A typical virtual machine will be gigabytes in size, since they have to exhibit all the characteristics of a legitimate computer. All of that virtualization creates additional overhead, even with “bare-metal” VMs that interact more closely with the underlying hardware. In addition, VMs aren’t very flexible. Each one has to be configured prior to starting with the exact amount of physical hardware (CPUs, memory, etc.) that it, and it alone, has access to. Virtual machines can’t share resources, and the ammount alloted to them can’t be modified at runtime. So although a physical machine can run multiple VMs, its limited in terms of its total resources. Containers leverage a lot of the benefits of virtual machines while avoiding their detriments, and they do it in a very clever way. Recall that virtual machines created a significant amount of overhead by recreating every aspect of the physical computer in software. Containers skip this and leverage the underlying kernel of the host, effectively sharing the low level code and resources with the host and other containers. In addition, they also share common binaries and packages. In reality, containers aren’t so much a virtualized computer as they are a shim: the real work is keeping track of the ways that a particular container differs from the actual machine its running on. By only keeping up with the differences, containers are dramatically smaller and faster. Here’s what I mean concretely: the ISO for Ubuntu 14.04 on I have downloaded is 649 megabytes. If I download the same version as a Docker container image, it’s only 188 megabytes. Similarly, starting an Ubuntu VM takes around 30 seconds on my machine (Macbook Pro with SSD), even if it just headless. A container, however, will take less than a second. But with all this sharing going on, doesn’t that negate one of our primary reasons for choosing VMs: that we would have completely isolated environments? Actually, no. Containers maintain all their “differences”, what makes them unique to the host and other containers, constantly. The effect is that they are in fact completely isolated on a logical level. They may share a file or a library under the hood, but its completely transparent to you, the user. The fact that containers are still isolated while also being lightweight means that we can use them similarly to the way we can use VMs with much less overhead. We can be confident that our apps will operate the way we expect them too because we can literally ship the environment with the app all bundled up in neat containers. It can be tempting, especially at the outset, to view containers simply as virtual machines, particularly since the analogy is so elegant. However the two differ in some substantial ways; not only technologically, but functionally. First of all, containers should be ephemeral. They should be logically small and capable of quickly being started and stopped. They should not serve as a location for data that needs to be maintained over time (for that, you need volumes). Additionally, containers should only run one main process. This is important. Since containers are lightweight, we should use them as such. Since containers are ephemeral, we shouldn’t rely on them sticking around. By breaking up our app into multiple containers, we can acheive greater modularity and scalability, though not without some redesign. Enough theory, let’s actually get our hands dirty. To utilize containers yourself, you’ll need a containerization engine. The most popular one out there is Docker. Instruction for installing on your platform can be found here. If everything went smoothly, you should be able to run docker info and get some reasonable output. 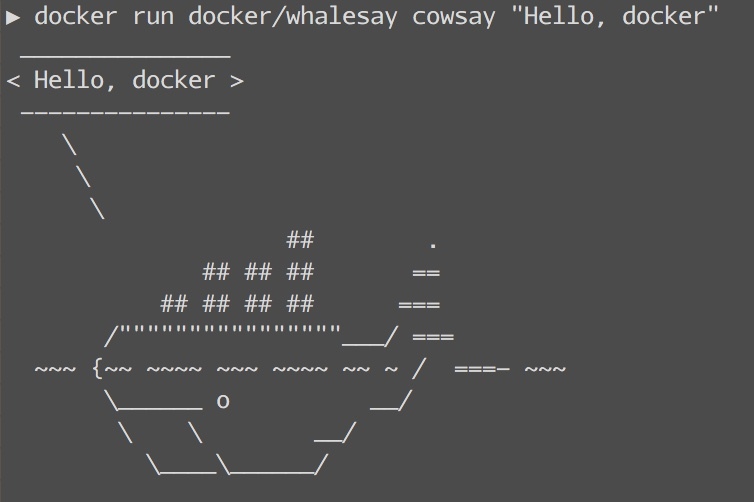 $ docker run docker/whalesay cowsay "Hello, docker"
The command should take a few seconds to run fully. If this is your first time running this command, Docker has to pull (download) the image first. An image in Docker is analogous to an snapshot of a VM. It serves as a template from which we build all of our containers off of. However, each container from this image won’t cause the image to be reconstructed, since the container will simply keep track of how it differs from that base image. Concretely, this means that no matter how many containers of an image we spin up, we only need to have one copy of the image on disk. Images are almost always layered, which is why you probably saw multiple lines downloading after issuing the command. Even these layers can be reused by Docker. So if in the future you use a different, but similar, image, the download time (and disk space) will be decreased. Once the cowsay command ends, the container will promptly stop. However, it will stick around should you want to run it again. You can view your running containers with docker ps and view all containers with docker ps -a.
Let’s toy around with this some more. If you ran the docker/whalesay container from the previous section, you should have the image saved on your computer. You can verify this with docker images. Here, the -it flags give us an “interactive” and “tty” run on our container. We also execute bash, which will serve as our long-running process. After executing this command, you should see a different terminal prompt, coming from inside your container. Feel free to mess around and issue any commands you normally could on an Ubuntu machine. But be warned: any changes you make die along with the container. Do not store data inside a container. Instead you should use volumes to export the data to a more persistent location. When you’re done, you can exit the container by exiting the bash shell: <Ctrl-d>. I would be remiss if I did not specifically clarify a security concern regarding containers: containers are not a securely isolated solution. Although we spoke of the isolation that containers offer, they fundamentally share the kernel with the host operating system, and are therefore not secure in their own right. The common solution is to run Docker from within a (single) virtual machine. Since the VM is securely isolated, the host machine is not at risk.